KING ABDUL AZIZ : bin Abdul Rahman bin Faisal Al-Saud, born in Riyadh November 24, 1880. Proclaimed King of Hejaz in 1926 and King of Nejd in 1928. Unified both provinces and became King of Saudi Arabia September 22, 1932. Died in Taif November 9, 1953. Abdul Aziz fathered 45 sons and numerous daughters. Saudi Arabia is named after Al-Saud, the only country in the world to be named after its ruler. 1. Turki born 1890 to Wahba bin Azzam. Died 1919. 2. King Saud born 1902 to Wahba bin Azzam. Died February 23, 1969. King Saud fathered 45 sons. 3. Khaled born 1903. Died 1903. 4. King Faisal Born in Riyadh 1904. Son of Tarfa bint Abdullah. Killed March 25, 1975 by Faisal bin Musaid. He fathered 8 sons. Saud. Minster of Foreign Affairs. Turki. Head of Saudi intelligence. 5. Fahd born 1905. Died 1919. 6. Muhammad born 1910. Son of Juhara bint Musaid. 7. King Khaled born 1912. Died 1982. He fathered 4 sons. 8. Saad. Born 1914. Died 1919. 9. Nasir. Born 1920. Son of Bazza. 10. Saad born 1920. Son of Juhara bint Saad Al-Sudeiri. 11. King Fahd born 1921 son of Hossa bint Ahmad Al-Sudeiri. Faisal, Head of youth programs. Died of drug overdose 1998. 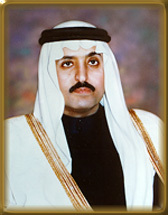 Mohamad Governor of the Eastern Province. 12. Mansour born 1922 son of Shahida. Died May 1951. 13. Crown Prince Abdullah born 1923 son of Bint Asi Al Shuraim (Shammar tribe). 14. Bandar born 1923. Son of Bazza. 15. Musaid born in Riyadh 1923. 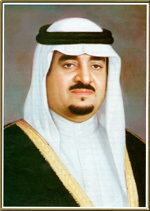 Son of Jauhara bint Saad al-Sudairi. Faisal. Killed King Faisal March 25, 1975. Executed June 1975. 16. Sultan. Born in Riyadh 1924. Son of Hossa bint Ahmed al-Sudairi. Minister of Defense. Bandar. Ambassador to the U.S. since 1984. Turki, Assistant Director, Ministry of Information. 17. Abdul Mohsen. Born in Riyadh 1925. 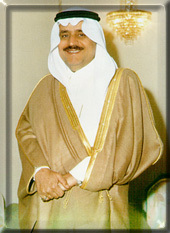 Son of Jauhara bint Saad al-Sudairi. 18. Mishaal. Born in Riyadh 1926. Son of Shahida. 20. Talal. Born 1930. Son of Munayier. Died in Taif 1931. 22. Badr. Born 1931. Son of Haya bintSaad al-Suadairi. Died 1932. 23. Talal. Born in Riyadh 1931. Son of Munayier. 24. Mishairi. 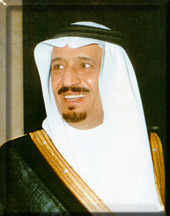 Born in Riaydh 1932. Son of Bushra. 25. Badr. Born in Riyadh 1933. Son of Haya bint Saad al-Sudairi. 26. Naef. Born in Riyadh 1933. Son of Hossa bint Ahmed al-Sudairi. 27. Nawwaf. Born in Riyadh 1934. Son of Munayier. 28. Turki. Born in Riyadh 1934. Son of Hossa bint Ahmed al-Sudairi. 29. Fawwaz. Born in Riyadh 1934. Son of Bazza. 30. Majid. Born in Riyadh 1934. Son of Mudhi. 31. Abdul Illah. 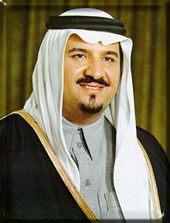 Born in Riyadh 1936. son of Haya bint Saad al-Sudairi. 32. Salman. Born in Riyadh 1936. Son of Hossa bint Ahmed al-Sudairi. 33. Majid. Born in Riyadh 1937. 34. Thamir. Born in Riyadh 1937. Son of Bint Al-Shalaan. Died 1959. 35. Ahmed. Born in Riyadh 1937. Youngest son of Hossa bint Ahmed al-Sudairi. 36. Abdul Majid. Born in Riyadh 1940. Son of Haya bint Saad al-Sudairi. 37. Mamduh. Born in Riyadh 1940. Son of Bint al-Shalaan. 38. Abdul Salam. Born in Riyadh 1941. Deceased. 39. Hidhlul. Born in Riyadh 1941. Son of Saida al-Yamania. 40. Mashhur. Born in Riyadh 1942. Son of Bint Al-Shalaan. 41. Sattam. Born in Riyadh 1943. 42. Miqrin. Born in Riyadh 1943. Son of Baraka al-Yamania. 43. namless. Born in Riyadh 1942. Died 1944. 44. Hamud. Born in Riyadh 1947. Son of Futaima al-Yamania. 45. nameless. Born in Riyadh 1952. Deceased.